At a time when people are migrating from drought-hit Bundelkhand, a local farmer in a Chhatarpur village refusing to leave his village is inspiring people to stay put and grow flower on their own. 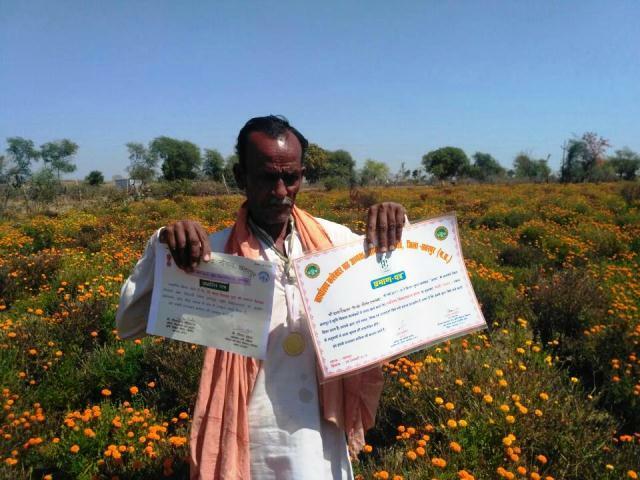 He grows drought resistant marigold on his farm and earns a good profit. He is now inspiring other farmers in the area to adopt growing flowers like marigold, said administrative authorities. Marigold flowers are naturally drought tolerant and can withstand vagaries of weather quite well. Many farmers in the region are struggling to make both ends meet and they are unable to bear the crop losses and pressure of the moneylenders. There have been regular reports about farmers committing suicide. The success story of this farmer has emerged as a ray of hope for other struggling farmers in the area, says the authorities. “Farming is challenging in drought prone Bundelkhand where cross losses is a regular phenomenon. You can’t bank on it for a regular income to run your household. Before starting growing flowers, I used to be a farm labourer and had given my farm to other farmers for contract farming. At that time I had also plans to migrate to a big city for a better earning but flower cultivation changed my life”, said Raikwar. On what motivated him to grow flowers Raikwar said he had gone on a pilgrimage to Kumbh mela at Allahabad several years ago. “A person from our neighbouring village had a flower shop there. I stayed with him at his place and used to help him at the shop. I found that he was earning a huge profit by selling flowers which he used to purchase from the local farmers”, he said. Raikwar said it was the flower seller who suggested him to grow flowers as traditional Rabi and Kharif crop. “After returning I inquired from agriculture department about flower cultivation. I installed a ‘Gobar tas plant’ as I had cattle and set up an earthworm manure pit with the help of agriculture department”, he said. Raikwar said he started growing marigold using cowdung and organic earth worm manure. “The result was good and as time passed I started earning a good profit from flower cultivation. In one year we grow marigold crop three times. Every season I earn around Rs 85000 while the input cost is Rs 15000”. “Around 50 to 70 kg of flowers are plucked daily from the farm and sent to Chhatarpur market. During peak marriage season, we send flowers to Jhansi also. My two sons have also joined me in this business. My younger son is pursuing BSc in agriculture stream from Nowgawh Government College. Raikwar’s success story has also inspired other farmers in the area. Bachu Kushwaha, a farmer in neighbouring village said after seeing Raikwar’s blooming business he too started flower cultivation on his half acre land. “Now I am also earning a good profit. Other farmers of my village and neighbouring villages are also coming to me for advice and soon you will see whole of this area is blooming with flowers”, he said. Chhatarpur collector Ramesh Bhandari said farmer Bala Raikwar was motivating many farmers to look for other means to earn their livelihood besides growing traditional crops. That’s why Raikwar was awarded as the best farmer of his block on January 26 by the government.